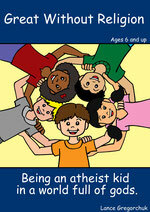 Over nine million parents in the U.S. are raising children without theistic religion. The PARENTING BEYOND BELIEF WORKSHOP, a unique half-day event with author and educator Dale McGowan, offers encouragement and practical solutions for secular parenting in a religious world. Based on the freethinking philosophy of the book Newsweek called "a compelling read," the PARENTING BEYOND BELIEF WORKSHOP is empowering secular parents across the country to raise ethical, caring, confident kids without religion. Workshops are hosted by local groups, including Ethical Societies, freethought groups, UU fellowships, and parent meetups. For information on bringing the PBB Workshop to your location, contact events agent Duncan Crary. Anyone in the greater Vancouver, Canada area should check out the Secular Parenting kick off BBQ being hosted by the BC Humniasts this weekend.